Maybe it’s because I’ve always loved particular things, things without comparison anywhere else, the bits that make a city unique. Maybe its because I love bringing people to somewhere that looks dingy but delivers top notch food. Maybe it’s just a factor of my wallet. Whatever the reason, I love greasy spoons, holes in the wall, run down places with one specialty they’ve been serving for thirty years. Whenever I find one, it brings me the purest joy, and I spend a good deal of my eating time in whatever city I may be in seeking them out. For cities I’ve long been a resident of, this leads to a long and deep list over the years. Presented for you here, are my favorite greasy spoons in London. This one really has a special place in my heart. Stumbling through Chinatown one evening, my brother and myself were looking for some good Chinese food. We spent hours deciding between lackluster options before our mother called us and told us to come home. We were too stubborn to give up, and pressed on to find a Japanese place that has shaped my experience of London ever since. Tokyo Diner is located in London’s Chinatown off Liecester Square. It’s 12-12 hours provide a late night option that is valuable in a sleepy megapolis like London, and its food is tasty, cheap, and comes in large portions. Towards the end of Edgeware Road, a long and straight thoroughfare whose abundance of perfume shops, kebabs and luxury car dealerships makes you think you’re in the UAE, lies unassuming Mandalay. The hours are ambiguous, the culinary fare unquestionable. Mandalay serves up the incredibly delicious and oft underappreciated cuisine of Burma (formerly known as Myanmar) a delicious pallet similar to Thai and Indian food with a special focus around scrumptious crunchy fritters. Again, Mandalay won’t hurt your wallet, with what is probably the best price performance of any restaurant in London. Try the lunch special. The Czech and Slovak Club has to be the most unassuming restaurant in the world. You’ll pass by it three or four times before you realize you’re in the right place. Housed within—well… a house, the Czech and Slovak Club approaches its interior design and ambiance with about as much creativity as it did its name. The place looks like a weird Knights of Columbus meeting room, but serves up excellent and very cheap Czech food. They also have a variety of Czech beers (among the best in the world) on tap, and a beautiful outdoor garden space for those few months of glorious London sunshine. 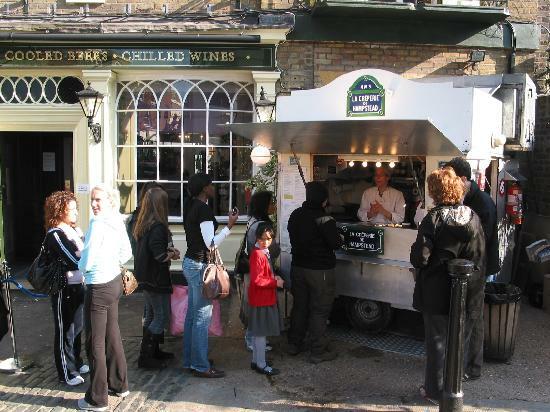 A staple of any Hampsteader’s routine is a stop at the famous Hampstead Creperie. I’ve been to Paris, and can say without any hestitance that these crepes are up there with the very best of them, truly world class. Wait in the ever long line for sweet or savory treats, the Belgian chocolate and ham and cheese being personal favorites. Whatever your preference, Hampstead Creperie will never disappoint and can make a bad night good, and a good night better.